Prime Minister Voreqe Bainimarama says Fijians are now truly connected with the rest of the world and set to make our mark. “And that is something truly worth celebrating,” he said before doing the global launch of a new smart phone App, called Instacharge, at the Grand Pacific Hotel in Suva last night. Once a phone is charged 100 per cent, the excess power is saved in the App, which will recharge the battery automatically when it is low. Suva was used as a launch site through local IT entrepreneur, Gaurangbhai Patel, of Global J.V Partnership, which will market the product here. The App inventor, American Douglas Stewart, said it was a privilege to launch it here and was aiming to reach one billion users. 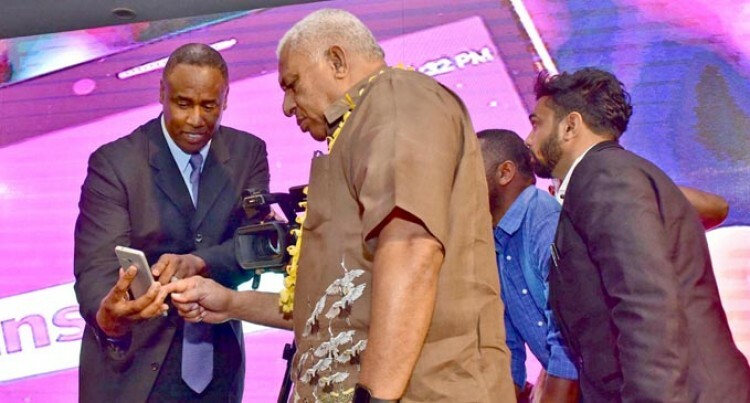 Mr Bainimarama said his Government was determined to keep Fiji at the forefront of the telecommunications revolution that was sweeping the world. “From a group of islands that were relatively isolated and in which communication for our parents and grandparents constituted of wireless and a land-line telephone, if they were lucky,” he said. He said Fiji had made some great advances in the ICT sector in recent years. “We are very proud of the fact that not only do Fijians enjoy an astonishing level of access to telecommunication services for a nation of our size and stage of development,” he said. He said the Fijian people had also shown a remarkable aptitude and enthusiasm to embrace new technology, whether it was hardware or software. He said getting connected had never been easier or cheaper for ordinary people. “Since we regulated the ICT sector in 2008, we’ve seen greater competition between our Telcos and lower prices,” he said. He said the ICT sector had contributed an average of around 6.3 per cent of our GDP each year from 2007 to 2015. “Wired and wireless networks cover about 95 per cent of the country,” he said. “Mobile phone subscriptions have increased by 7.7 per cent each year from 2007 to 20014. “The total number of subscribers reached more than 876,000 by the end of the same period. “Which is pretty remarkable when at the last census in 2007, there were just over 837,000 people in the entire country. “This suggests that many people have multiple phones and multiple SIM cards to get the best deals from their service providers. And are benefiting from that competition. “In terms of Internet usage, household penetration of Broadband increased from 7.1 per cent in 2007 to 30.7 per cent in 2014. A four-fold increase in seven years. “While the percentage of Fijians with Internet access rose from 10.9 per cent to 41.8 per cent over the same period. “A figure boosted by the Government’s program to provide free Internet access in our Telecentres, mostly located in schools outside the main population areas. “We are determined that access to telecommunications isn’t only for the relatively affluent people in urban areas. Because this isn’t luxury but a right- an essential component of modern living. “Friends, all this has been accompanied by the extension of 3G and 4G coverage; the development of the region’s first national broadband policy; the continued expansion of e-Government services; the Digital Literacy Program; a state-of-the-art Government data centre built to Tier Two standards; plans for the establishment of a national Internet exchange point; the Universal Service Access project; Various concessions on smart phones and telecommunications devices and ongoing tax incentive to attract ICT Investment. “All of which adds up to a nation that is increasingly connected, Fijian to Fijian and Fijians to the rest of the world.